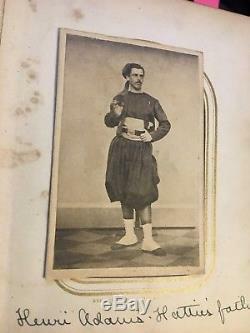 Original CDV of Henry / Henri V. Adams, 55th NY Volunteer Infantry, Lafayette Guard, Zouaves. He is ID'd on the back of this Zouave CDV and on the album page this CDV was originally in, as "Henri Adams, Hattie's father". He is also identified in a second photo in the same album in which he is wearing civilian clothes. The civilian photo has a. 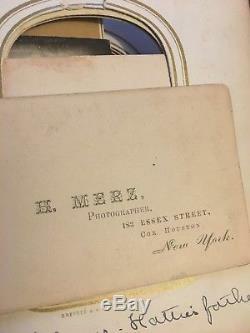 New York studio imprint, the Zouave photo has none. I can take a pic of the front and back of the civilian CDV on request. Neither the album nor the civilian CDV of Adams are included, but can be made available. The writing on the back is in German - I researched the family and his wife's (Minna Koop) side was German; Henri was born in France, but moved to the US in the late-1850s, where he lived in New York, and then enlisted in the war. I think I read somewhere while researching that the Lafayette Guard, or at least the ones that wore the French Zouave uniforms, were all of French heritage. 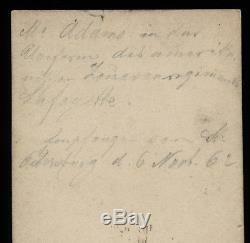 The writing on the back of this Zouave CDV, very roughly translated says, in part: Mr. Adams in his American uniform, Lafayette regiment. Then more words, and finally what appears to be a date of November 1862. 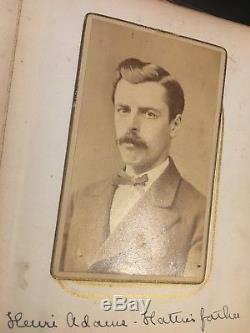 CDV is in very good condition though it appears to be trimmed, measuring 3 1/2" x 2 3/8". Rare gettysburg soldier photo 1860s history fashion photography photograph victorian picture antique vintage 1800s. 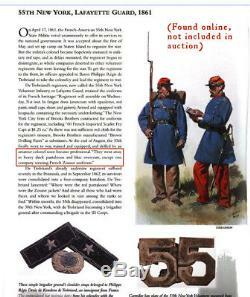 The item "ID'd Civil War Soldier 55th New York Lafayette Guard Zouave" is in sale since Monday, June 11, 2018. This item is in the category "Collectibles\Photographic Images\Vintage & Antique (Pre-1940)\CDVs". The seller is "jack_mord" and is located in Woodinville, Washington. This item can be shipped worldwide.